These gems tend to fade into the background after you've lived here a while. One of the advantages to living in an old city, is that you get see bits of history peaking through in the most random of places. And I’m not just talking about the grandeur of Victorian architecture, but the great unassuming signage painted on old buildings. These gems tend to fade into the background after you’ve lived here a while, but I think it’s good to recognize these unsung heroes of place-making. So here are two to get us started, spotted around MLK Blvd. Just 2 fonts. All caps. Like a mayun! Sure the kerning leaves a lot to be desired but it’s reassuring to know that there were people choosing to keep it simple even back then. 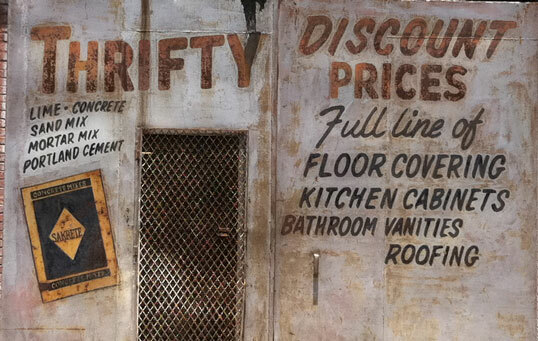 Ahhh, the good ol’ days when you could run out and get your lime and concrete and pick out some fetching cabinets all in the same place… and for rock bottom prices! This greeted me at the Green truck pub last night.